The Surfrider Foundation will host a public workshop to solicit input from the beach-going community about restoring public access to Martin’s Beach. The workshop will be held on Monday, July 20, 2015 at the Pacifica Community Center (540 Crespi Drive, Pacifica) from 6pm to 9pm. At the workshop, public input will help inform the State Lands Commission’s negotiations with property owner Vinod Khosla. The Commission is tasked with negotiating an agreement that will restore public access to Martin’s Beach, as required by California Senate Bill 968, signed into law last year. The legislation was a result of Khosla obstructing public access since 2009 despite Californians using the beach for generations. Recently, news media reported an “opening” of Martin’s Beach for the summer. The Surfrider Foundation does not view the seasonal and selective opening of the gate to constitute compliance with San Mateo County Superior Court Judge Barbara J. Mallach’s order to restore public access; nor does the Foundation feel that this move is necessarily indicative of long-term access restoration. 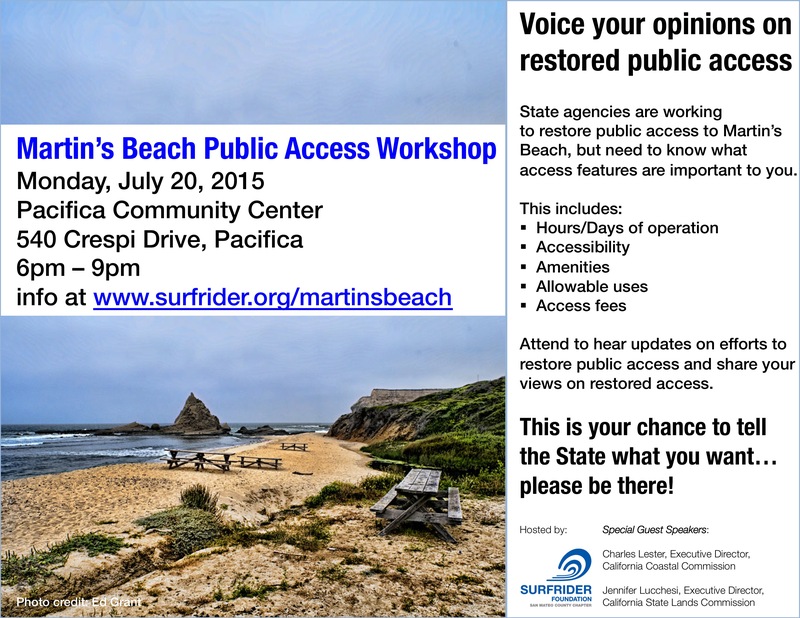 The workshop will consist of updates on efforts to restore access to Martin’s Beach from agency leads and litigators of the Surfrider Foundation v. Martins Beach I and II, LLCs and roundtable discussions of various aspects of access such as hours and days of operation, accessibility, allowable uses, and access fees. Participating members of the public will be asked to write down and submit their opinions on these subjects. Representatives from both the State Lands Commission and Coastal Commission will be present at the workshop and provide updates to the public on their agencies’ roles in restoring public access.